Mallorca – just like its sister island Ibiza – is a tale of two suntraps: according to the stereotype, beerbellied holidaymakers step off the plane and head straight for the beach resorts immediately to the west and east of Palma, while the Daily Telegraph and Panama hat-clutching tribe hire a car and speed north to Pollensa, up into the mountains or scatter themselves in discreet fincas dotted around the rest of the island. However, in the past few years, while the rest of the world has gasped in horror at the dire straits of the property market on mainland Spain, savvy investors have been piling money into the coastal resorts in the south-west and 17th-century streets of Palma, with impressive results. The island, which has long appealed to the yachting crowd, has, nevertheless, suffered in terms of chic credibility when compared with other Mediterranean hotspots, including the Costa Smeralda in Sardinia and the French Riviera. As a result, house prices for seafront villas and apartments have never matched the heady heights of these pinnacles of the other summer sunspots, but how long will this differential last? In the past few weeks, a colossal house of 1,400 sq m, which was built by an Englishman in the 1960s, with direct views over Port Andratx in the south-west has come onto the market with a Cap d’Antibes-style price tag of €38 million. One street within this, one of the most spectacular harbour villages on the island, has so far this year achieved an average price per square metre of €27,000, rivalling the finest postcodes of London. In Portixol in Palma, where, just a decade or so ago, very basic two-up, two-down fisherman’s cottages could be picked up for €50,000, such houses are now achieving comfortably above €1 million as hungry German, Scandinavian and British investors vie to own one of these achingly trendy seafront houses. Palma – which has long been hailed by enthusiasts a ‘mini Barcelona’, but never with entirely convincing results -now rivals its mainland equivalent in almost every way: the selection of boutique hotels is excellent and growing fast; the restaurants and bars are equally on the up; the 17th-century buildings that make up the old town are constantly being bought (often but not always by Northern European investors) and carefully restored; delis -once only found in the basement supermarkets of El Corte Inglés-are now common, along with coffee shops and big-name boutiques. Property prices are inevitably on the rise. ‘We had a few tough years in Palma after 2007, but, since the summer of 2012, the situation has changed,’ says Terence Panton of Engel & Völkers Palma (00 34 971 21 41 40). 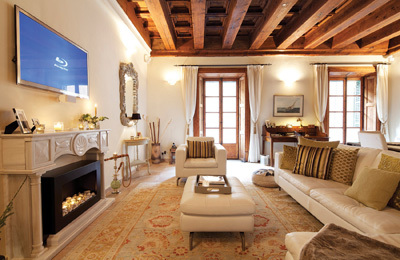 ‘Now, if you want a one-bedroom pied-à-terre with a terrace in Palma, you need to spend at least €375,000 and anything more substantial is going to be well over €1 million.’ He cites a development of a building on the edge of the Old Town as an example: both the penthouses were sold off-plan and only two one-bedroom apartments remain (from €375,000). Move down the coast and the story is no different. Where once the only refreshment opportunity on the beaches were basic shacks or chiringuitos de la playa offering (albeit often rather good) sandwiches and snacks, today, a new breed of beach clubs is springing up, offering more sophisticated dining (often soundtracked with the strums of dance music). In Costa d’en Blanes, once a byword for cheap holiday resort hotels and pubs serving fish and chips, the Bendinat Group (which has a long presence on the island) bought a rundown seafront apartment block and has transformed it into a fully serviced apartment block with an indoor and outdoor pool, gym, bar and direct beach access-almost half of which sold to Swedish buyers off-plan- where the two- and three-bedroom apartments are already on the resale market for more than €1 million. Each apartment is served by renewable-energy sources, including solar panels, but the views are the giveaway: open-plan Gaggenau kitchen/ living rooms open out onto the panoramic terrace. It’s a different world from before. 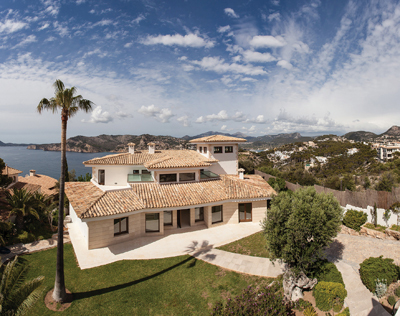 ‘My patch in the south-west of the island is achieving an average price per property of €1.4 million,’ explains Hans Lenz, the Mallorcan-born partner of Engel & Völkers South West. An increasingly popular option for those relocating to Mallorca is to set up the family on the island-there is an excellent selection of international schools from The Academy in Marratxi (www.theacademyschool.com) to Agora in Puerto Portals (www.nace.edu.es/portals)-and commute back to London or Munich for a fourday week. 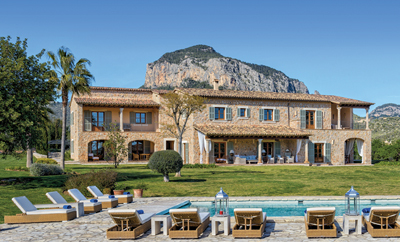 ‘We’re seeing more and more families relocating to Mallorca and Ibiza and using their European hubs to run their businesses from the island. It gives them easy access to most European nations,’ explains Christian de Meillac of Knight Frank. Dark wooden doors open into a large, open-plan living room with an impressive panoramic view of the harbour entrance of Port Andratx and the island of Dragonera. This classic country finca stands in 31 acres near the village of Alaró. It comes with underfloor heating, a saltwater swimming pool, and a gym. First Mallorca (00 34 971 67 94 44).